SPONSORED---Beginning of the new year is a great time to freshly evaluate your mind and soul oriented goals. Bushwick's original yoga studio, Loom Yoga Center located inside 1087 Flushing Ave Shop #117 is the perfect answer to your prayers for greater peace of mind and healthier, flexible body. Loom Yoga Center’s philosophy is to make yoga available and accessible to everybody, regardless of experience, background, or financial concerns. Uniquely positioned to understand the needs of the Bushwick community, Loom Yoga Center is currently offering their most affordable pricing structure yet in an effort to facilitate daily practice for any and all who desire it. "As our neighborhood continues to change and evolve around us, we strive to provide a firm foundation for the community. Seva, or selfless service, is an essential part of the yogic lifestyle," says founder and lifelong Brooklyn resident Zalmen Labin. New students can now sign up for a monthly unlimited membership for $40 for the first month and continue for just $59 per month thereafter. With their approximately 60 classes per week, Loom Yoga Center ensures that you will find a class suited to your style and time to practice whether you're a busy 9-5er or a bartender who works late nights. Loom Yoga Center’s carefully curated roster of teachers offers years of experience teaching and a variety of different yoga backgrounds including vinyasa, ashtanga, jivamukti, and hatha. If you're feeling inspired to try something new, take a class of Aerial Yoga or Aerial Pilates, Belly dance, or Alexander technique. Guided Meditation class meets regularly as well. 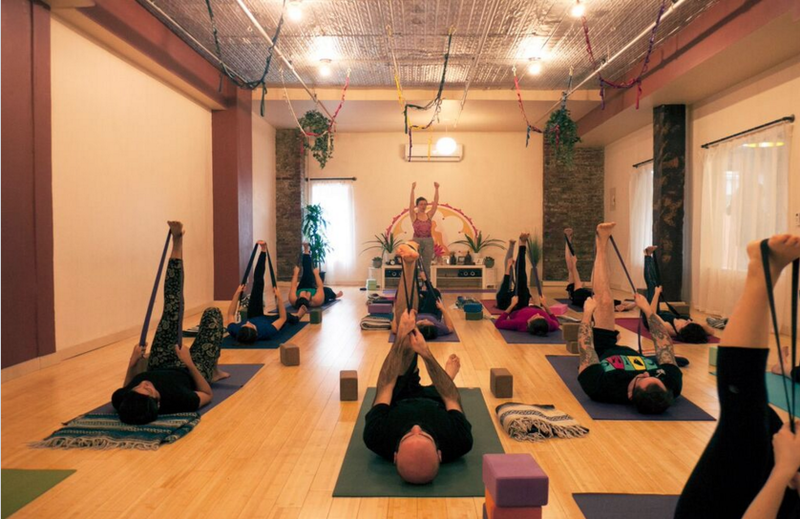 For those of us who are ready to go deeper into their yoga practice, or want to start teaching yoga, Loom Yoga Center offers a yoga alliance certified 200-hour Yoga Teacher Training, right here in Bushwick. With the extensive curriculum and hands-on personalized training, students are guided through intelligent sequencing techniques to learn how to structure their own Vinyasa yoga class. A strong emphasis is placed on students discovering their personal voice and teaching style. Upon completion, graduates are given the opportunity to gain real-world teaching experience by leading community classes and to practice for professional yoga teacher auditions. Loom Yoga Center offers 2 distinct yoga teacher trainings per year, the summer intensive which is a 25 day full time program, and the winter immersive which is a 4 month weekend program. Sign up for the upcoming summer of 2016 intensive 200-hour Yoga Teacher Training before March 20, and receive $500 off! Loom Yoga Center, 1087 Flushing Ave Shop #117, Bushwick.